Ghee (Sanskrit: Ghṛta), is a class of clarified butter that originated in ancient India. It is commonly used in Middle Eastern cuisine, cuisine of the Indian subcontinent, Southeast Asian cuisine, traditional medicine, and religious rituals. The word ghee comes from Sanskrit: घृत (ghṛta-, IPA: [ɡʱr̩tɐ]) 'clarified butter', from ghṛ- 'to sprinkle'. Traditionally, ghee (Sanskrit: गोघृत, go-ghṛta) is always made from bovine milk, as cows are considered sacred, and it is a sacred requirement in Vedic yajña and homa (fire rituals), through the medium of Agni (fire) to offer oblations to various deities. (See Yajurveda). Fire ritual have been performed dating back over 5,000 years. They are thought to be auspicious for ceremonies such as marriage, funerals, etc. Ghee is also necessary in Vedic worship of mūrtis (divine deities), with aarti (offering of ghee lamp) called diyā or dīpa and for Pañcāmṛta (Panchamruta) where ghee along with mishri (mishri is different from sugar), honey, milk, and dahi (curd) is used for bathing the deities on the appearance day of Krishna on Janmashtami, Śiva (Shiva) on Mahā-śivarātrī (Maha Shivaratri). There is a hymn to ghee. In the Mahabharata, the kaurava were born from pots of ghee. Finding ghee pure enough to use for sacred purposes is a problem these days for devout Hindus, since many large-scale producers add salt to their product. Ghee is also used in bhang in order to heat the cannabis to cause decarboxylation, making the drink psychoactive. A dosa in India served with ghee. Ghee is common in cuisines from the Indian subcontinent, including traditional rice preparations (such as biryani). In Maharashtra, polis or Indian breads are accompanied with ghee. For example, 'Puranpoli', a typical Maharashtrian dish is eaten with lots of ghee. In Rajasthan, ghee often accompanies baati. All over north India, ghee tops roti. In Karnataka and Tamil Nadu, ghee tops dosa, and kesari bhath. In Bengal (both West Bengal and Bangladesh) and Gujarat, khichdi is a traditional evening meal of rice with lentils, cooked in curry made from dahi (yogurt), cumin seeds, curry leaves, cornflour, turmeric, garlic, salt and ghee. It is also an ingredient in kadhi and Indian sweets, such as Mysore pak and varieties of halva and laddu. Pakistani and Punjabi restaurants typically incorporate large amounts of ghee, sometimes brushing naan and roti with it, either during preparation or just before serving. In the state of Odisha ghee is widely used in regional Odia cusines such as 'Khechedi' and 'Dalma'. Particularly the satwik type of food prepared in almost temples in Odisha use a ghee as a major ingredient for their culnary skills. Ghee is widely used in South Indian cuisine for tempering curries, in preparation of rice dishes and sweets. South Indians have a habit of adding ghee to their rice before eating it with pickles and curries. South Indians are one of the biggest consumers of ghee. The people from Telangana and Andhra Pradesh especially use ghee for preparation of savoury and sweet dishes alike. Ghee is important to traditional Punjabi cuisine, with parathas, daals and curries often using ghee instead of oil for a richer taste. 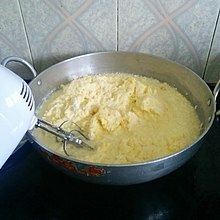 The type of ghee, in terms of animal source, tends to vary with the dish; for example, ghee prepared from cow's milk (Bengali: গাওয়া ঘী, gaoa ghi) is traditional with rice or roti or as a finishing drizzle atop a curry or daal (lentils) whereas buffalo-milk ghee is more typical for general cooking purposes. The main flavor components of ghee are carbonyls, free fatty acids, lactones, and alcohols. Along with the flavor of milk fat, the ripening of the butter and temperature at which it is clarified also affect the flavor. For example, ghee produced by the clarification of butter at 100 °C or less results in a mild flavor, whereas batches produced at 120 °C produce a strong flavor. Ghee differs slightly in its production. The process of creating traditional clarified butter is complete once the water is evaporated and the fat (clarified butter) is separated from the milk solids. However, the production of ghee includes simmering the butter, which makes it nutty-tasting and aromatic. A traditional Ayurvedic recipe for ghee is to boil raw milk, let it cool to 110 °F (43 °C). After letting it sit covered at room temperature for around 12 hours, add a bit of dahi (yogurt) to it and let it sit overnight. This makes more yogurt. This is churned with water, to obtain cultured butter, which is used to simmer into ghee. Ayurveda considers pure ghee to be sāttvik or sattva-guṇi (in the "mode of goodness"), when used as food. It is the main ingredient in some of the Ayurvedic medicines, and is included under catuh mahā sneha (the four main oils: ghṛta, taila, vasā, and majjā) along with sesame oil, muscle fat, and bone marrow. Though eight types of ghee are mentioned in Ayurvedic classics, ghee made of human breast milk and cow's ghee are favored. Ghee is also used in Ayurvedas for constipation and ulcers. Like any clarified butter, ghee is composed almost entirely of fat, 62% of which consists of saturated fats. It is also rich in oxidized cholesterol: 259 μg/g, or 12.3% of total cholesterol. Ghee is also sometimes called desi (country-made) ghee or asli (genuine) ghee to distinguish it from the modern "vegetable ghee". Several communities outside the Indian subcontinent make ghee. Egyptians make a product called samna baladi, meaning "countryside butter" identical to ghee in terms of process and result, but commonly made from water buffalo milk instead of cow milk, and white in color. Also, during the process, the darkened milk solids are considered a delicacy called morta which is a salty condiment used sparingly as a spread, or as an addition on fava dishes. Regular samna is also made from cow milk in Egypt and is often yellowish. Ghee is also used by various peoples in the Horn of Africa. Tesmi (in Tigrinya language) is the clarified butter prepared in the country of Eritrea. The preparation is similar to that of ghee but the butter is oftentimes combined with garlic and other spices found native to the area. In Ethiopia, niter kibbeh is used in much the same way as ghee, but with spices added during the process that result in distinctive tastes. In North Africa, Maghrebis take this one step further, aging spiced ghee for months or even years, resulting in a product called smen. In northeastern Brazil, an unrefrigerated butter similar to ghee, called manteiga-de-garrafa (butter-in-a-bottle) or manteiga-da-terra (butter of the land), is common. In Switzerland as well as bordering areas, butter was rendered in the old days to preserve the product for several months without refrigeration. "Boiled butter", as it is commonly called, is used extensively to finish a typical dish of rösti, the Swiss version of hash browns. It gives the dish a distinct flavor in baking of various pastor use in baked goods as a substitute for fresh butter to enhance flavor. There are 4 common methods through which ghee is prepared. Industrial preparation on the other hand by FMCG companies such as Patanjali is done by using "white butter", usually sourced from other dairies and contractors. In the cream butter method, cream is separated from milk and churned to produced butter. The butter then undergoes heat clarification. Sour raw milk is churned into butter. The butter is boiled in an open pan to allow the water to evaporate. The hot ghee is transferred and stored. Fresh cream, cultured or washed cream is directly converted to ghee. This method requires a long heating time and produces a caramelized flavor. Milk is separated into cream which is then churned into butter. The butter undergoes heat clarification to produce ghee. Suitable for large quantities of butter. Butter is melted at 80-85 °C for 30 minutes. Layers of protein particles, fat and buttermilk are induced. The buttermilk is drained out. The remaining layers of fat are heated to a temperature of 110 °C to remove moisture and develop flavor. Ghee may be packaged in airtight glass jars and stored without refrigeration. 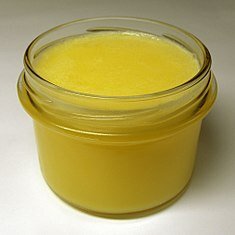 Ghee is generally found to be packaged in airtight glass jars. They should be kept away from direct sunlight as sunlight can cause moisture to build inside the jar. Moisture can cause deterioration to the ghee's quality as well as reduce its shelf life. To prevent the acceleration of the oxidation process, they should be protected from anything that causes it, such as UV rays from the sunlight and fluorescent lights. If the jar is unopened, it does not need to be refrigerated as long as the previously mentioned conditions are met. Once opened, they can be stored in a kitchen cabinet for up to 3 months. Afterwards, it may be left in the refrigerator for up to a year. The refrigerator causes ghee to harden but if it is left at room temperature for a while, it will soften up again. Ghee may be made of milk from various domesticated ungulates, such as cows and sheep. The composition of ghee varies depending on the animal whose milk has been used. The vitamin A content ranged from 315 to 375 international units per 100 grams. Palmitic acid and oleic acid were two of the main fatty acids found in both cow and sheep ghee. The saturated fatty acid profile was 53.9 to 66.8 percent, the unsaturated fatty acid profile was 22.8 to 38.0 and the other fatty acids was 3.5 to 10.4. Cholesterol amounts ranged from 252 to 284 mg/100 grams. The market size of ghee in India is 10,000 crores 11 or US$1.5 Billion as of 2016. India is the world's largest producer of buffalo and cow milk and consequently also the largest producer and consumer of ghee. ^ Fitzgerald, James L.; Adrianus, Johannes; Buitenen, Bernardus (2003-02-15). The Mahabharata, Volume 7: Book 11: The Book of the Women Book 12 ..., Part 1. p. 613. ISBN 9780226252506. ^ Gottlieb, Adam (1993). Cooking with Cannabis: The Most Effective Methods of Preparing Food and Drink with Marijuana, Hashish, and Hash Oil. Ronin Publishing. p. 7. ISBN 978-0-914171-55-3. ^ Drake, Bill (2002). The Marijuana Food Handbook. Ronin Publishing. p. 18. ISBN 978-0-914171-99-7. ^ "What are the advantages and disadvantages of butter and ghee when it comes to cooking?". Archived from the original on April 4, 2015. Retrieved May 11, 2015. ^ a b Rama Murthy, M.K. (1980). "Factors Affecting the Composition, Flavour and Textural Properties of Ghee" (PDF). Indian Dairyman. 32: 765–768. ^ Jaffrey, Madhur (1982). Madhur Jaffrey's Indian Cooking, p. 211. London: BBC Books. ISBN 0-8120-6548-4, cited in Wikipedia contributors. "Clarified butter." Wikipedia, The Free Encyclopedia. Wikipedia, The Free Encyclopedia, 10 Jul. 2013. Web. 10 Jul. 2013. ^ Sahni, Julie (1998). Julie Sahni's Introduction to Indian Cooking, p. 217 under "usli ghee." Berkeley: Ten Speed Press. ISBN 0-89815-976-8, cited in Wikipedia contributors. "Clarified butter." Wikipedia, The Free Encyclopedia. Wikipedia, The Free Encyclopedia, 10 Jul. 2013. Web. 10 Jul. 2013. ^ Joshi, KS (2014). "Docosahexaenoic acid content is significantly higher in ghrita prepared by traditional Ayurvedic method". J Ayurveda Integr Med. 5 (2): 85–8. doi:10.4103/0975-9476.131730. PMC 4061595. PMID 24948858. ^ a b "Nutrition data for Butter oil, anhydrous (ghee) per 100 gram reference amount". US Department of Agriculture, National Nutrient Database. May 2016. Retrieved 12 March 2018. ^ Otaegui-Arrazola, A.; Menéndez-Carreño, M.; Ansorena, D.; Astiasarán, I. (December 2010). "Oxysterols: A world to explore". Food and Chemical Toxicology. 48 (12): 3289–3303. doi:10.1016/j.fct.2010.09.023. ISSN 1873-6351. PMID 20870006. ^ Jacobson, M. S. (1987-09-19). "Cholesterol oxides in Indian ghee: possible cause of unexplained high risk of atherosclerosis in Indian immigrant populations". Lancet. 2 (8560): 656–658. ISSN 0140-6736. PMID 2887943. ^ Narain, Priyanka Pathak (2017). Godman To Tycoon: The untold story of Baba Ramdev (2 ed.). New Delhi: Juggernaut Publications. ISBN 978-9386228383. ^ L. Sserunjogi, Mohammed; Abrahamsen, Roger; Narvhus, Judith (1998-08-01). "A Review Paper: Current Knowledge of Ghee and Related Products". International Dairy Journal. 8 (8): 677–688. doi:10.1016/S0958-6946(98)00106-X. ^ "Ghee Care". Goddess Ghee. Retrieved 2018-08-11. ^ a b c d AbdulrhmanAl-Khalifah, HassanAl-Kahtani (1993-01-01). "Composition of ghee (Samn Barri's) from cow's and sheep's milk". Food Chemistry. 46 (4): 373–375. doi:10.1016/0308-8146(93)90007-3. ISSN 0308-8146. ^ "Delhi's tax free budget: Desi ghee to cost less in Delhi". timesofindia-economictimes. Retrieved 27 December 2015.